Renault reveals tech-laden Mk5 Clio, with quality and ease of use part of design boss's "interior revolution"
...is set to marry a honed exterior look with a dramatic new interior dominated by a Tesla-style infotainment screen. It will also be capable of semi-autonomous driving. Renault has revealed the interior of its new, fifth-generation Clio, with the supermini's exterior design due to be unveiled tomorrow (29 January). The Clio will distinguish itself from rivals by being one of the most technologically advanced models in its class when it launches at the Geneva motor show. The move is part of a bid by the French car maker to keep its supermini at the forefront of the sector, especially in the face of increasing competition from compact SUVs. The exterior styling will be evolutionary, keeping elements such as rear door handles hidden in the door frames, albeit with a more grown-up look in line with the Mégane. It’s also expected to take design cues from the Symbioz concept car, shown last year. The interior, though, is where the bigger changes take place. Renault design boss Laurens van den Acker accepts the firm “dramatically needed to improve perceived quality”, and reckons 70% of the time he spent with the new Clio was on its interior. He accepts criticism of current Renault interiors, prompting his team to focus on material design and fit and finish. “That’s really where we’ve been criticised in the last few years, and we’re trying to create a very coherent concept," said van den Acker. Thinner seats have increased rear leg room in this five-door-only model by 26mm, while the glovebox is bigger and the 330-391-litre boot is said to be the best in class. To this end, the Clio will be available with a 9.3in portrait-angled touchscreen, said to be inspired by that of the much larger and pricier Espace (not sold in the UK). There's also a 10.0in digital insrument binnacle that can display sat-nav instructions. However, van den Acker claims the interior will be easier to use than the outgoing car, with things like temperature control returning to dashboard buttons. The new Clio is built on the CMF-B platform, an updated version of that used on the existing model and shared with the Nissan Micra. It will use 1.0-litre and 1.3-litre petrol engines, the latter developed with Mercedes, as well as a 1.5-litre diesel with up to 115bhp. A 48V mild-hybrid 1.5 dCi, badged Eco2, is planned but won't be available at launch. A plug-in hybrid model is understood to be due in 2020. 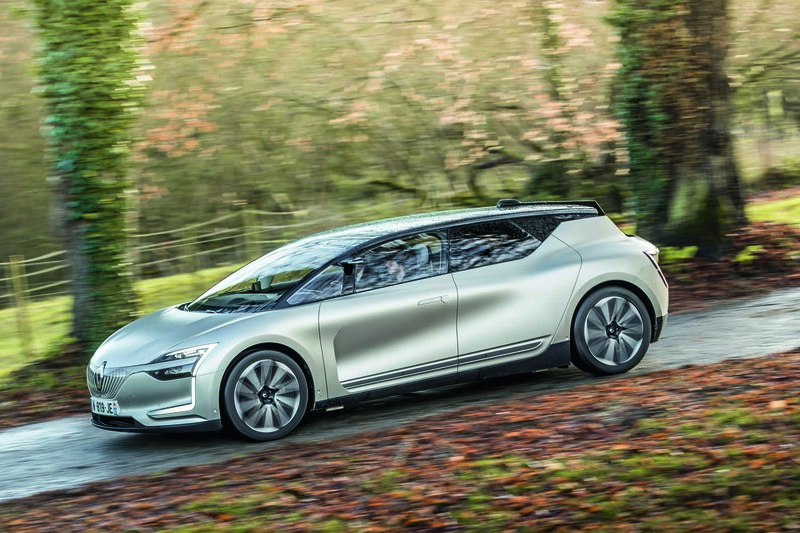 Last year, then Renault boss Carlos Ghosn announced the French car maker would launch eight electric vehicles in the next five years. However, a fully electric variant of the Clio is not expected to be one of them. That’s because Renault executives are worried it would steal sales from its existing Zoe electric supermini. The Zoe was the best-selling electric car in Europe in 2017. There will be a new Clio RS, though. The hot range-topper will be unveiled in 2020. The current model is in run-out, with Renault recently releasing the limited-edition RS18 as its swansong before the next generation arrives. The next Clio RS could carry over the 1.6-litre four-cylinder engine of the current car, but it is understood to be more likely to adopt the 1.8-litre turbo petrol engine from the new Mégane RS, but with less power. Volkswagen followed a similar strategy by using a detuned Golf GTI engine in the recently launched Polo GTI. The other key advancement is autonomous technology, not often found in this segment. The Clio is due to feature level one and level two autonomy, shared with vehicles from partner brand Nissan (and demonstrated in the Symbioz concept, pictured below). Level one means it will have the latest safety systems such as adaptive cruise control and lane-keeping assist, increasingly popular in larger cars, but level two is the biggest step change: the Clio will have hands-off capability (although using it remains illegal), being able to park and keep in lane by itself. Although UK consumers continue to buy far more Fiestas than Clios, the Clio is easily the best-selling supermini in Europe, despite being six years old. According to figures from analyst firm Jato, it sold 327,395 units in 2017, compared with the 272,061 units of the second-placed Polo. Globally, the Clio is in fourth place, beaten by the Polo, Fiesta and Suzuki Swift, mainly due to more modest sales outside Europe. That can be partially explained by the popularity in developing markets such as Latin America and India of its cheaper sibling, the Dacia Sandero, which is fifth globally. Although Clio sales have held strong and the broader supermini market is still growing, its biggest threat comes from compact SUVs. With the arrival to the segment of Volkswagen Group brands such as Seat, Skoda and VW, as well as Hyundai and Kia, there will be increasingly more small SUV sales, which, in turn, will stall those of superminis. After its reveal, the Clio will go on sale by the summer. Prices are expected to rise over the current model, which kicks off at £12,450, but remain cheaper than the Fiesta, which starts at £13,715. The battle between the previous-generation Fiesta and the outgoing Clio was always closely fought. Not least because of the Clio’s ability to transition from comfy cruiser to enjoyably adept back-road steer. Ford has recently updated the Fiesta and improved the recipe in several areas. How should Renault respond? When launched, the current Clio was unusually refined for its class and Renault would do well to prioritise the development of that particular characteristic. But surpassing the Fiesta as an all-round package would almost certainly involve firming up the suspension. Do they jeopardise the new Clio’s comfort to realise Fiesta-like dynamics, or are they brave enough to continue to plough their own very comfortable and refined furrow? That’s the conundrum facing Renault’s engineers. I haven't seen the new Clio, however I have seen a prototype 2019/2020 Captur, if the interior of the Clio is anything like that of the Captur then it will be a big leap forward in quality and design. I also expect the front end treatment of Clio to closely resemble that of the Megane. The Clio is a larger and much more accomplished car than the Zoe wich has city life at its heart (as a second car as often as not). The two products are simply not comparable but going hybrid or full electric with the Clio would be a very damaging sales prospect in many markets outside 'metropolitan Europe'. The commercial risk is far too great on a bread and butter car that brings in steady and not negligible revenue, far from! If nothing else, it does reveal the true thinking behind the electrification of the brand: forward with extreme caution! It would be nice to have more details of the projected engine outputs, however, especially the 1.3! The Zoe is an electric Clio - it sits on the same platform !! The ARE comparable - they are effectively ICE and electric versions of the same car, although the Zoe looks far nicer. The Zoe is 18mm LONGER than the Clio. Sorry what were you saying about the Clio being longer than the Zoe ? What were you saying about teh Zoe being a "city car at heart" ? (it has a 250 mile range now if you were going to cite range as a reason you think its a "city car"). If the new Clio looks anything like the current one or the Megane it ll be bad news, if only it looked like the Symbioz, sigh. Poor Polo. Poor Fiesta. These fresh, less than a year old models are still outsold in Europe in by the Clio IV. Imagine the impact the Clio V will have. Really?. You can comment on this piece and you chose to waste your time with that?. Sigh. Both the whale and any fish have the smarts you can only aspire to. What's with the slanty eyed buck toothed look? Just because BMW is doing it doesn't make it right!